MRT Line in the spotlight – The Orange line is coming soon! Over the past 5 years, the Mass Rapid Transit Authority of Thailand has been transforming the transport system within Bangkok. One of the most daring and visionary projects is the creation of the MRT mass transit system in the city centre which includes several new underground lines. This new transit system should improve transport within Bangkok greatly, and it should also help ease congestion that is rife in busy areas of the city. The MRT Orange Line is one of the planned lines within the Bangkok Metropolitan Area – this line will be one of the most important new transport developments in the city and on its completion will stretch for some 37km underground. 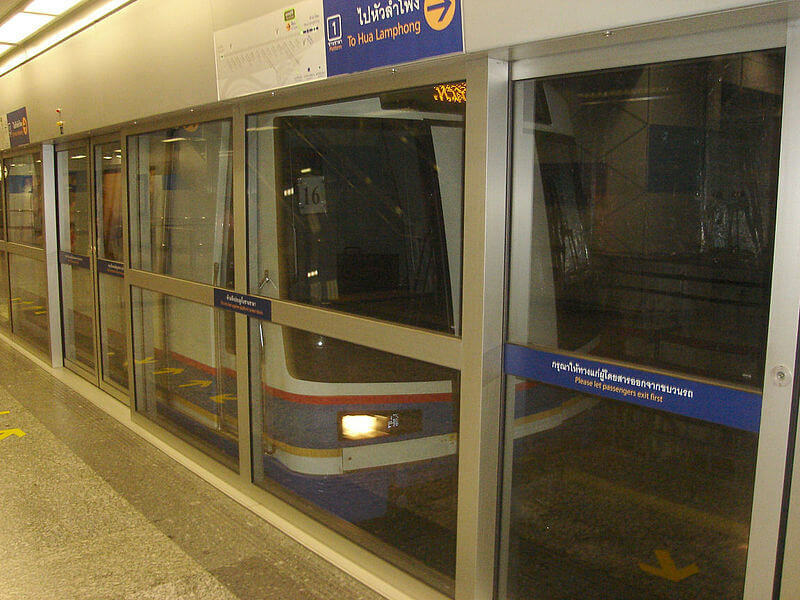 From 2009 onwards the Thai government has created various plans for the MRT mass transit system. Originally, there were plans for two main lines – the brown line and the orange line. In 2009, however, plans were scrapped and the two lines were merged together to form the single orange line. In 2012, alternations were made again to the plan and some proposed stations were scrapped and sections of the line rerouted. The whole orange line was initially planned for opening in 2013 however due to protests by locals and the continual change of plans and routes, the final opening is set to take place in 2022. Official construction of the orange line begun in June 2017 and the budget is estimated to be at over 82 billion Baht for phase one alone. Throughout its course, the orange line uses both overground and underground track and passes through a range of important locations such as Hua Mak Stadium, Bang Kapi District, Min Buri District and Ratchathewi district. Furthermore, the orange line will also intersect with other MRT tracks such as the blue line and yellow line. At its operating peak, it is hoped that the orange line will service over 110,000 passengers per day. It is expected that the Bangkok orange line will provide improved transport links from eastern Bangkok into the city centre. Up until now, Min Buri and surrounding districts have been quite isolated and do not benefit from the transport links available in central Bangkok. Areas such as Min Buri, Khan Na Yao and Saphan Sung should benefit from improved accessibility. Furthermore, this transit development is already paving the way for many new residential and commercial opportunities. We have seen this happen in other areas of Bangkok where MRT lines have been developed – interest grows and so does the potential for new construction. There are some incredible real estate investment opportunities springing up in the areas of the new lines, and the investors with the ability to speculate on the future are expected to yield the highest returns. The orange line represents a drastic improvement to the MRT system of Bangkok – this new line should open up a range of new possibilities and further improve the transportation within the city.